The internal carotid artery is one of the two terminal branches of the common carotid artery (the other being the external carotid artery), arising at the level of the upper border of the thyroid cartilage. 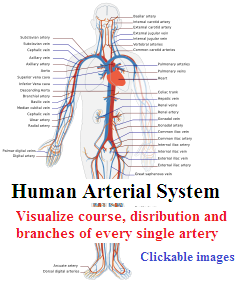 The artery gives off branches to the brain, forehead, eye and part of nose. The artery moves upwards to the base of the skull, entering the cranial cavity through the carotid canal (present within the petrous part of the temporal bone). The internal carotid artery, along with the internal jugular vein and vagus nerve, lies enclosed within the carotid sheath, a part of the deep cervical fascia. 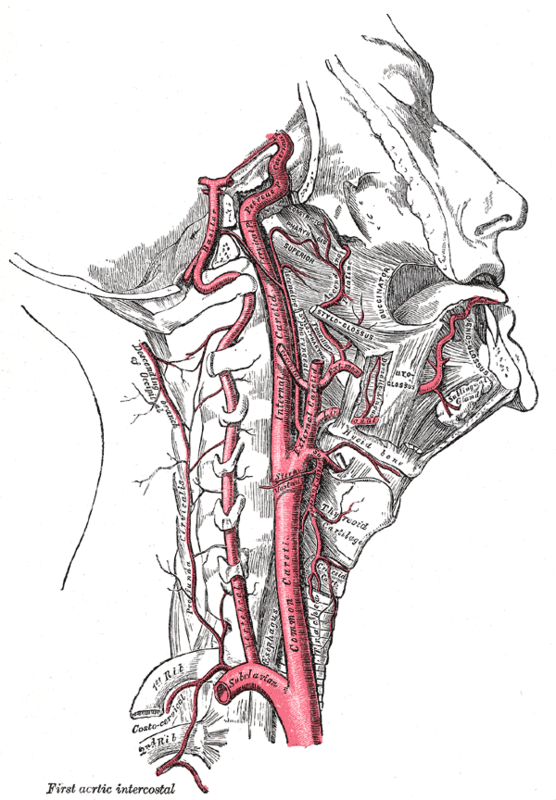 The artery may be seen within the carotid triangle as it is superficial at the beginning. 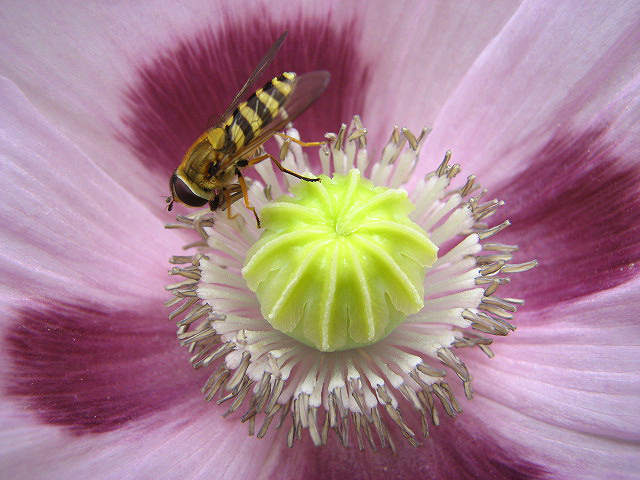 Then it moves upwards passing deep to the parotid gland. The internal carotid artery is visible on the medial side of the anterior clinoid process running horizontally forward through the cavernous sinus and perforates the dura mater. On perforating the arachnoid mater, the artery enters the subarachnoid space. Finally, the artery reaches the region of the medial end of the lateral cerebral sulcus by turning posteriorly and divides into two terminal branches; the anterior and middle cerebral arteries. Hypoglossal nerve, anterior border of sternocleidomastoid, fascia and skin. External carotid artery, parotid gland, pharyngeal branch of vagus, glossopharyngeal nerve. stylohyoid and stylopharyngeus muscle. Transverse processes of the upper three cervical vertebrae, longus capitis muscle and the sympathetic trunk. Vagus nerve and internal jugular vein. 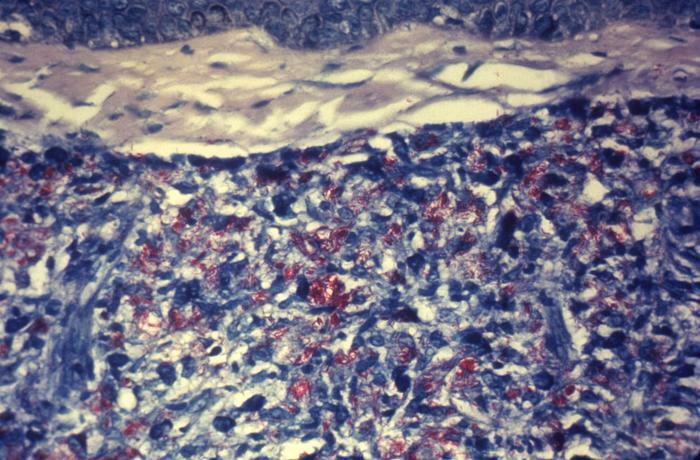 Superior laryngeal nerve and the pharyngeal wall. 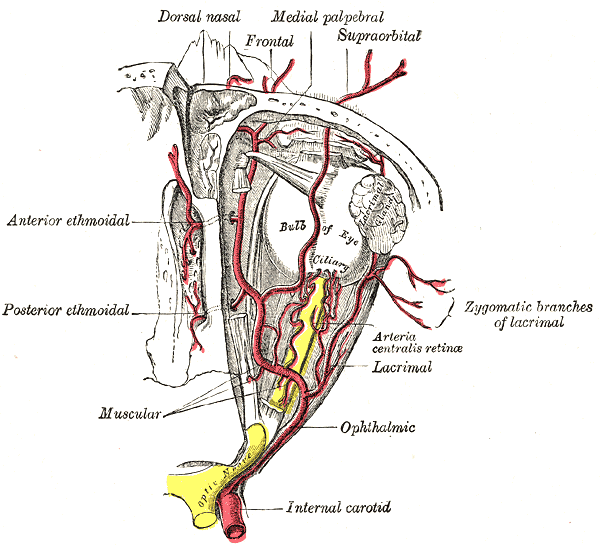 On emerging from the cavernous sinus, ophthalmic artery is given off from the internal carotid artery. The ophthalmic artery supplies the eye and other related structures as well as the scalp, frontal and ethmoidal air sinuses as well as the dorsum of the nose by entering the orbit through the optic canal. 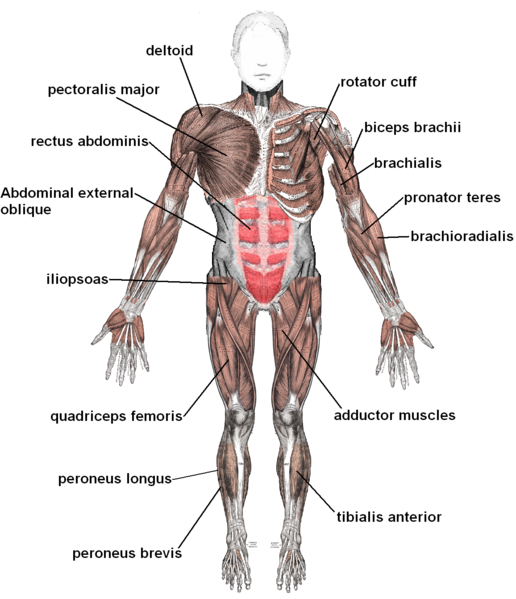 The posterior communicating artery is given off near the origin of the terminal branches and runs posteriorly above the oculomotor nerve. 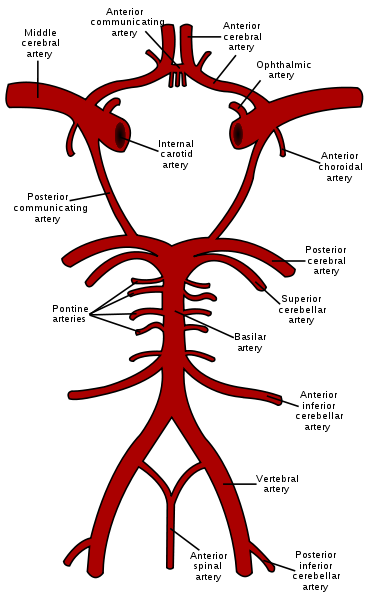 It joins the posterior cerebral artery to complete the circle of Willis. The choroidal artery is given off near the origin of the terminal branches. It enters the inferior horn of the lateral ventricle by passing posteriorly and lying close to the optic tract. The choroidal artery supplies the crus cerebri, optic tract, internal capsule and the lateral geniculate body. The anterior cerebral artery is one of the two terminal branches and enters the longitudinal fissure of cerebrum by moving forward, medial and superior to the optic nerve. 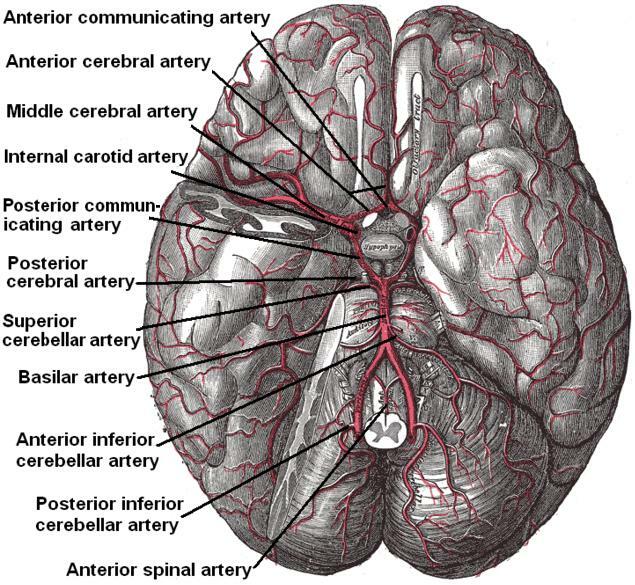 Here, the anterior communicating artery joins it to the anterior cerebral artery of the opposite side. The anterior cerebral artery anastomoses with the posterior cerebral artery by curving backwards over the corpus callosum. The medial surface of the cerebral cortex back to the parieto-occipital sulcus is supplied by the cortical branches as well as the strip of cortex about 2.5cm wide on the adjacent lateral surface. Thus the “leg area” of precentral gyrus is supplied by the anterior cerebral artery. 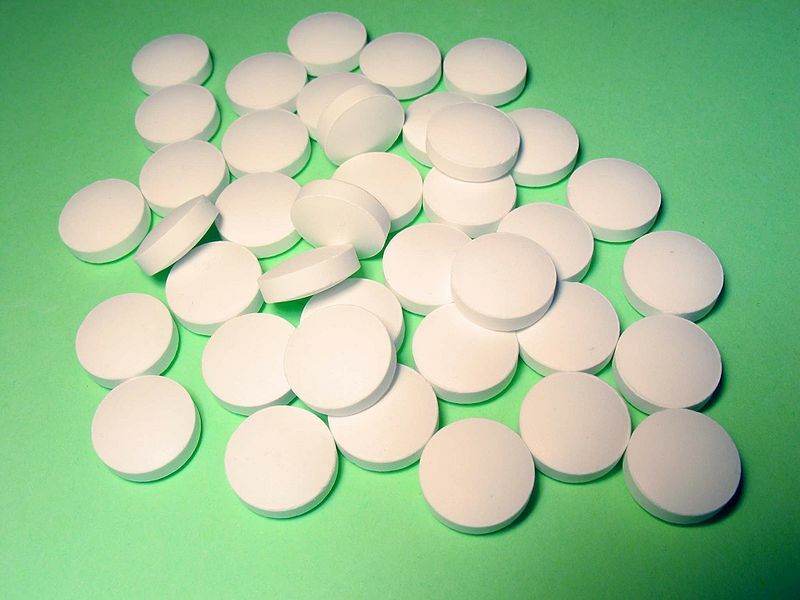 The central branches supply the lentiform and caudate nuclei as well as the internal capsule by piercing the anterior perforated substance. The middle cerebral artery can be seen running laterally in the lateral cerebral sulcus. The lateral surface of the cerebral hemisphere is supplied by the cortical branches except the small strip supplied by the anterior cerebral artery as well as the occipital pole and the inferolateral surface of the hemisphere, supplied by the posterior cerebral artery. The central branches supply the caudate and lentiform nuclei as well as the internal capsule by entering the anterior perforated surface.